The Highlands Street Fair is held annually on the Saturday during Father’s Day each June (moved in 2012). 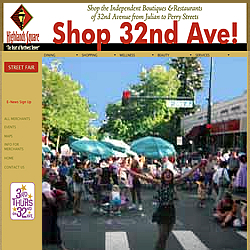 A true community celebration – the family friendly event brings people to the Highlands Square neighborhood “The Heart of Northwest Denver.” Music, Food, Vendors, Arts, Crafts, a great Kids zone, a Car Show, and more make this a great weekend (single day) event for the whole family. The event is free of charge and has been celebrated for nearly 30 years.